Beauty is said to be in the eye of the beholder, and appreciation of art often goes the same way. One person may herald a work of art as groundbreaking, important, or visionary, while another may dismiss the same work as junk. 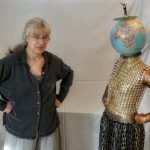 At the Whidbey Island Center for the Art’s Creative Recycled Art Projects (C.R.A.P.) exhibit, opening Friday, both will be true. 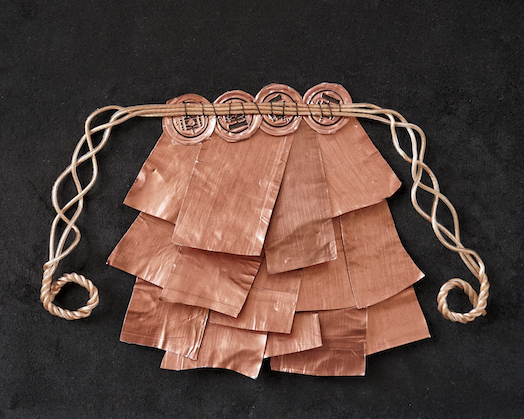 The unifying element of each of the seven featured artists’ work is found/recycled/repurposed items used in ways that delight and surprise — making previously unwanted items something to be coveted. Exhibit visitors will be greeted by a variety of media and efforts, including jewelry, sculpture, shadow boxes, and woven creations — each as unique as the individual spirits and skills of the artists who created them. Everything has value. Everything has beauty. Everything belongs. Another similarity between the women is that each came into her artistic calling as part of a roundabout journey. Sarah Primrose, for example, began working in recycled art after studying display, advertising, and design at Fashion Institute of Technology in Manhattan and then moved into stage and set design, along with stints at Tiffany and Co. Jewelry by Sarah Dial Primrose: “Infinity Beerings” are made of smashed bottle caps, silver tabs, silver circles, copper findings and brads, and crystal beads. 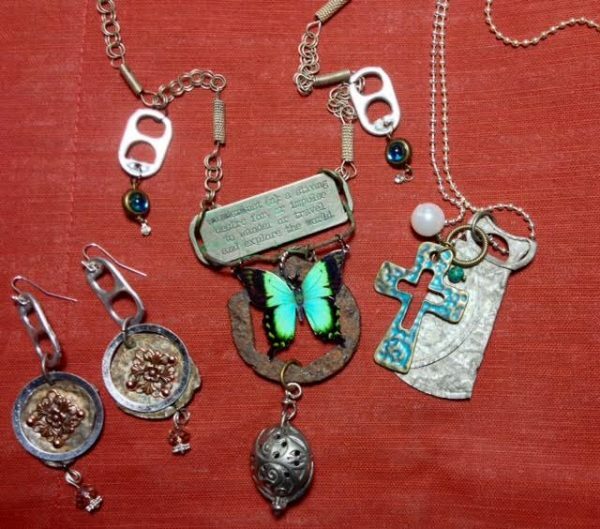 The “Wanderlust” necklace is made of an old rusted fragment, a wanderlust token, silver pull tabs, glass beads, an enamel butterfly, and an old silver ball charm. The “Found Religion” necklace is made of a smashed aluminum pull-tab top, verdigris cross, turquoise bead, and a faux pearl. Although Sara Saltee shares a name with Primrose, her path is very different. A self-taught artist with no formal training, Sara jokes that she became interested in making shrines and assemblages after an overly long stint in academia. But she has dabbled in art throughout her life. 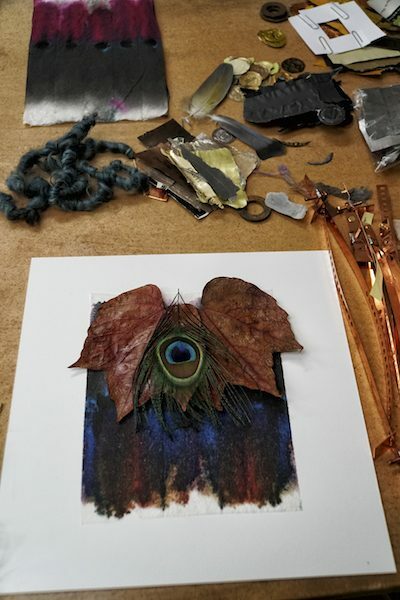 Janet Pheifer finds herself somewhere in the middle of the road to artistic endeavors: her professional life melds with her art, as both involve breathing new life into tired items; even fabricating something new from nothing. Some of the artists have formal training and some meandered onto their calling. A few create smaller scale art such as jewelry, while others are focused on large pieces of sculpture. In speaking with each of them, however, it becomes clear that there is a shared sense of wonder blended with nuts-and-bolts genius in the way they see and create. It is as if each of them is able to imbue the inanimate with a living spirit, moving them to protect and preserve the things others have discarded or ignored. Combine those human qualities with a pioneer woman’s instinct for extracting every last ounce of value from anything she touches, and it becomes possible to explain how the featured artists are able to spin beauty and meaning from random bits and pieces of detritus. 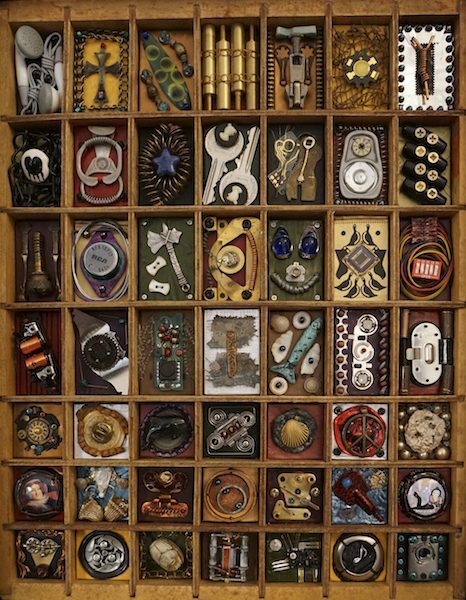 Recycled art is a variation of an early 20th-century artistic movement known as assemblage. At that time, Pablo Picasso began adding found items and more pronounced three-dimensional qualities to flat canvas compositions. By the early 1960s, there was enough interest to warrant an exhibit focused on assemblage techniques at the Museum of Modern Art in New York City. While breathing new life into castaway items is not a new trend, the seed planted by Picasso took root as the assemblage movement and now has blossomed into recycled art, aligning with enviro-centric 21st-century values (for a portion of the population, anyway). The exhibit, like the items that comprise the featured pieces, is set have multiple senses of utility, says WICA marketing manager Fritha Strand. 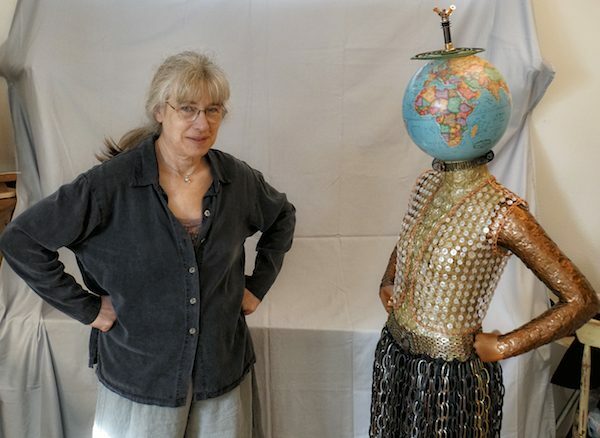 Above all, though, Strand feels the exhibit celebrates the Island residents’ orientation toward sustainability and environmental consciousness, placing those values on a pedestal, literally and figuratively. It speaks to Whidbey Islanders’ tendency toward environmentally conscious lifestyles and their reverence for the life force that comes from the island’s natural beauty. It can also be said that each artist exemplifies another trait of Islanders: their sheer dedication to rolling up sleeves, using what is on hand, and pulling it all together, creating in a unique result at the end of the day. These women know how to get the goods, get dirty, and get it done; flawlessly and with flair. Free. All art is for sale, with 30 percent of proceeds benefitting WICA. Friday, March 3, from 5 to 7 p.m.
Saturday and Sunday, March 4 and 5, from 1 to 5 p.m.
Saturday and Sunday, March 10 and 11, from 1 to 5 p.m.